iOS 7 made its public debut yesterday and judging by the slamming that Apple’s activation servers took, it looks like there’s plenty of excitement about the newest version of iOS. Hopefully lots of you have already been able to get iOS 7 installed on your iPads. Control Center: This is a new panel that’s full of useful controls – lead by the ability to quickly toggle key services on and off. 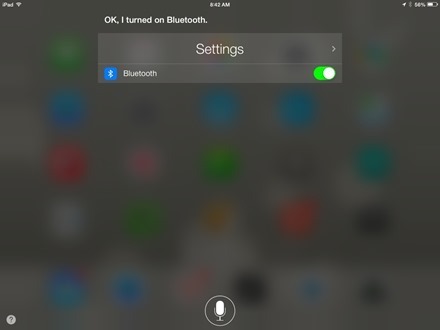 With a single tap in Control Center you can toggle WiFi, Bluetooth, Airplane Mode, Sound, Do Not Disturb Mode, AirDrop, and AirPlay on or off. From here you can also adjust brightness, adjust volume and use basic music player controls, start up the Timer feature in the Clock app, and open the Camera app. 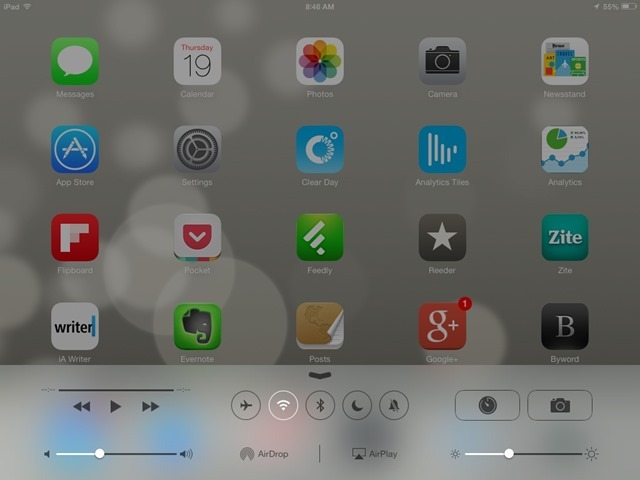 To launch Control Center you just swipe up with one finger from the bottom of the iPad screen. Spotlight Search: This is one is not a new feature of course, but it has moved. 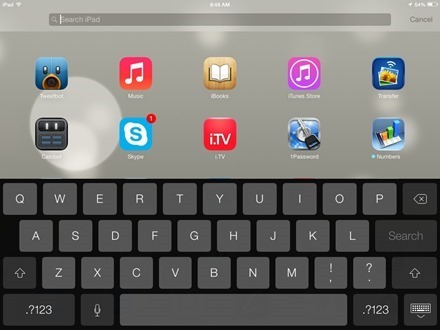 Prior to iOS 7 you invoked it with a swipe to the right. Now you do so with a quick swipe down. 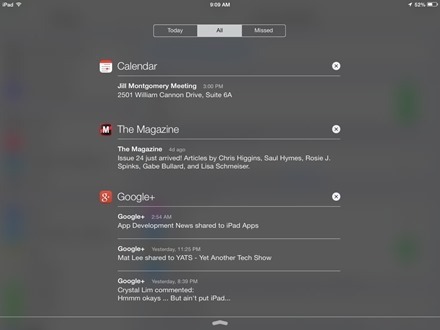 Real Multitasking & Slicker App Switching: iOS 7 brings real, intelligent multitasking to the iPad and offers a nicer method for quitting apps and rapidly switching between recently used apps. A double-tap on the home button or a four-finger swipe up from the bottom of the screen brings up a new Cards style view of running apps. These cards make it easier to recognize apps and don’t just show a thumbnail of an app, but a real snapshot of where you left off in each app. Tap on any of the cards to switch to that app; or swipe up on any card to quit that app. 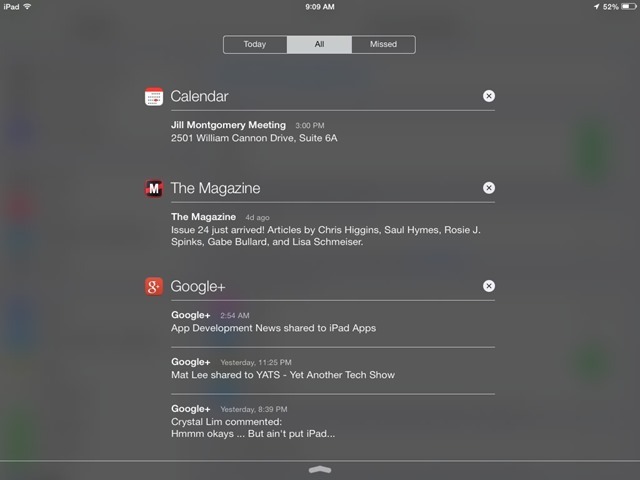 Notification Center: This is another iOS feature that is new and improved. It can now be launched with a swipe down from the top of the iPad screen from anywhere in the OS – home screens, within apps, and from the lock screen too. It now offers 3 tabs with notifications – Today, All, and Missed. New Gestures in the Mail App: A swipe left on an individual message gives you access to a Trash button and a More button that offers a popup menu with Reply, Forward, Flag and more actions. Safari Unified Smart Search Field: A lot of words to describe what we’ve known as the Omnibox on the Chrome browser for a long while – and a very welcome addition to Safari on the iPad. Instead of having an address bar and a search bar, the new, single bar can accept URLs or search terms now. Siri Is More Useful: Siri now searches more sources (Wikipedia and more), is better at recognizing when you’re talking, offers options for the speaking voice it uses, and can do more all around. Automatic App Updates: If you hate seeing that little red badge showing you how many iPad apps have updates available, you’ll love this new feature. iOS 7 can handle all app updates automatically in the background. You can turn this feature on or off via Settings > iTunes & App Store > Automatic Downloads – and the entry for Updates. 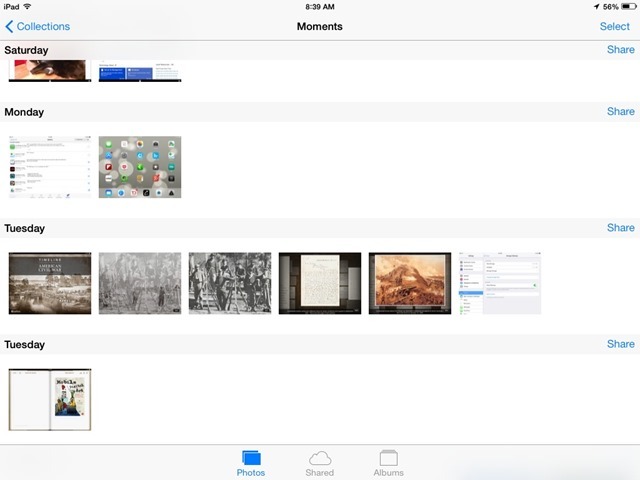 Photos App Changes: The Photos app has had a major revamp to the way it’s organized. The new default view is time-based – with Collections grouped by years / months / days. You can also switch to the Albums tab to see the old faithful Camera Roll and any other albums on your iPad. Dynamic Wallpapers: iOS 7 offers a number of attractive dynamic wallpapers, and it’s pleasantly surprising to see that these don’t seem to have much impact on battery life on the iPad. There are hundreds of new features in iOS 7, but these are some of the most interesting and notable ones that iPad users will be getting to know. What are your favorite and / or least favorite new features in iOS 7 for the iPad? I really hate the one finger swipe up from the bottom of the screen instead of the old four finger one to bring up the volume and brightness etc. – When browsing pages and scrolling through things it keeps coming up by mistake and then tapping the screen doesn’t get rid of it, you have to slide it back down again! Arggggg! Also on an iPad 2 safari and things seem to be MUCH more laggy than before. Like the windows phone style they have adopted though. how do I delete photos on my IPAD camera roll, can’t seem to figure it out! !